Meet Me Under the Mistletoe is a deep emerald green jelly packed with gold micro-flakies. Love. I want to have its babies. They'll be beautiful green polish babies. I can't get over how magnificent this polish is. Two coats with topcoat. The only downside is that because it's a jelly, it's not perfect at two coats. I applied it in relatively low light and didn't realize I had a some patchiness. Next time I would make sure to apply three coats. I would say the extra coat is worth it for the colour though. Or waiting more time between coats. But we all know I'm not capable of waiting. 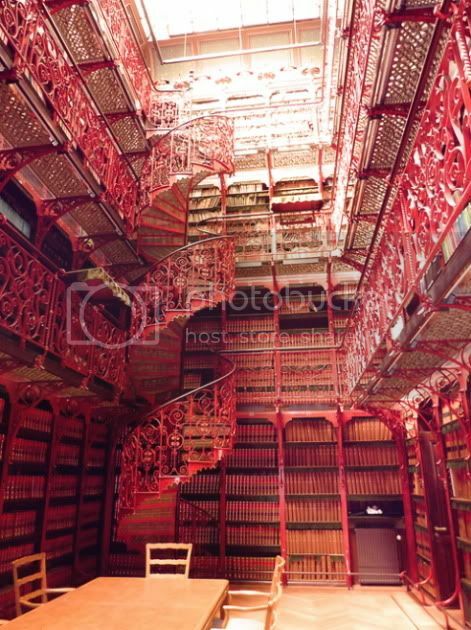 Pic of the Moment: Handelingenkamer library on Andrea's Tumblr. So. Gorgeous. Blog Business: Whoo! 600 followers. Small giveaway coming up. Stay tuned! Such a pretty polish (and a gorgeous library)! Can I just say that I love that it is called Orly. Lol. Also, it's super cute. Yeah, I totally pronounce it O Rly? But it's supposed to be or-ly. Lol. Boring. I actually never realized how pretty Mistletoe kisses was. Might have to be added to the ever growing want list. I'm speechless.. I need to visit this library!! Breathtaking!